A North Texas pastor said Ivanka Trump made a donation to his church to help migrant children at the border. 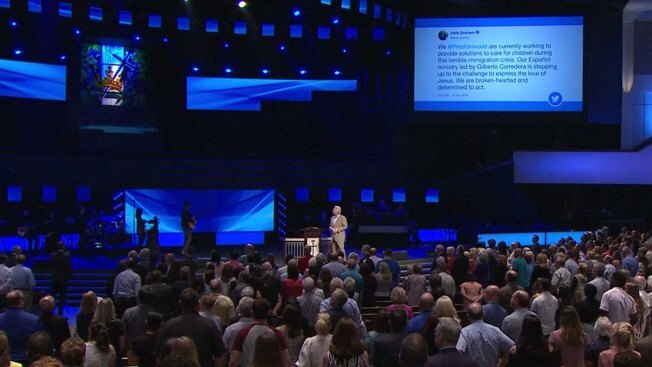 Pastor Jack Graham at Prestonwood Baptist Church in Plano said the president's daughter donated $50,000 to the church after a tweet Graham posted. Graham wrote on Twitter June 19, "We @Prestonwood are currently working to provide solutions to care for children during this terrible immigration crisis. Our Espanol ministry let by Gilberto Corredera is stepping up to the challenge to express the love of Jesus. We are broken-hearted and determined to act." Graham said soon after the tweet, Ivanka made the donation. "It came to us, we weren't expecting it, but I'm not surprised at her generosity," Graham said. The donation came before her father's executive order on Wednesday that ended family separation at the border. Graham said a group from Prestonwood Baptist Church plans to head down to the southern border after they assess how they can best help the situation. The church also plans to offer an online virtual tour. He said he hoped Ivanka will join them. "In the midst of all this political division… God's people can show love and compassion and help, which is what we want to do," Graham said.